Here are some ways to spruce up your classroom with easy bulletin boards. When preparing an eye-catching display, you don't actually need a bulletin board. Just frame a large area of one wall with bulletin board borders or trims. However, backgrounds are vital. Besides colored construction paper, use textured fabrics, felt or flannel, crepe paper, newpapers, aluminum foil, sandpaper, colored cellophane, or maps. Borders make the bulletin board. Use corrugated paper, twisted crepe paper, yarn or rope, pictures strung together, paper muffin cups, scalloped strips of poster board, wallpaper samples, and designs printed from your computer. Lettering conveys the message. Make your letters big, and keep the message short and simple. Mounting the same letters in two colors, one on top of the other, gives a shadow effect. 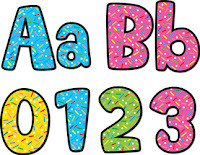 Cut your letters from corrugated paper, sticky-backed felt, patterned paper (such as that used for scrapbooking), textured paper, Form letters from colored feathers, and drinking straws bent into letter shapes. You can add a short Bible verse or your lesson theme to the bulletin board. Variety adds spice to your display. Add a third dimension to your bulletin board by placing a thick piece of cardboard or foam core behind the lettering. You can also glue cotton balls, twigs, feathers, yarn, rope, colored paper plates, holiday trims, or an old lampshade cut in half to your board. Make sure you take a photo of your completed board so you can easily recreate your artistic masterpiece in the future. For pre-made bulletin board sets and lots of fun bulletin board ideas, visit our Classroom Decorations Store. You'll also find attendance charts, posters, borders, lettering, stickers, and lots more—many items 30% to 50% off.